Director Peter Kelly has chosen to present the play in the round, which adds extra vividness to moments such as the trial scene when poor Mary Warren (Ellie Webber) is overcome by the deliberate hysteria of Abigail Williams (Laura Melville) and other hostile witnesses. John Davis’ debut performance with Studio Theatre, as John Proctor, greatly assisted by the fine, sensitive acting of Emily Prince as Proctor’s wife Elizabeth, becomes really affecting as his character comes to recognise the terrible choices he has to make. Also making noteworthy debuts are Penny Bunyan as Betty Parris, Monaya Abel as Tituba and Harvy Munnery as John Hale, while valuable contributions come from ‘veterans’ such as Ann Acton as Rebecca Nurse, Peter Mitchell as Giles Corey and, despite some over reliance on the prompt on this first night, Tim Greathead as Deputy Governor Danforth. THE only way I can describe The Crucible is intense from start to finish. 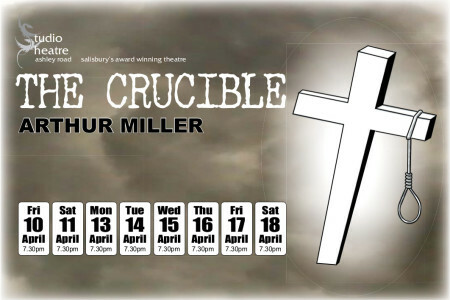 Studio Theatre once again delivered a brilliant production bringing Arthur Miller’s drama to Salisbury. This year marks the 100th anniversary of Miller’s birth. The drama is fictionalisation of the 1692 Salem witch hunts. As whispers of witchcraft echo around Salem suspicions run high after some of the local children are taken ill with a mysterious condition, including the daughter of Reverend Parris (Kevin Murdoch). And soon the witch hunt begins and the fingers start to point at many of the townsfolk. Newcomer John Davis gave a standout performance – commanding the stage as John Proctor. His performance was brilliantly complimented by Emily Prince, who plays his wife Elizabeth. Youngster Ellie Webber also gave a sterling performance as Mary Warren. Ellie is member of Studio’s Youth Theatre. The whole ensemble helped bring this dark tale to life and gave strong performances with some new faces as well as some more familiar faces taking to the stage. This entry was posted on April 18, 2015 by salisbury_matt in reviews.